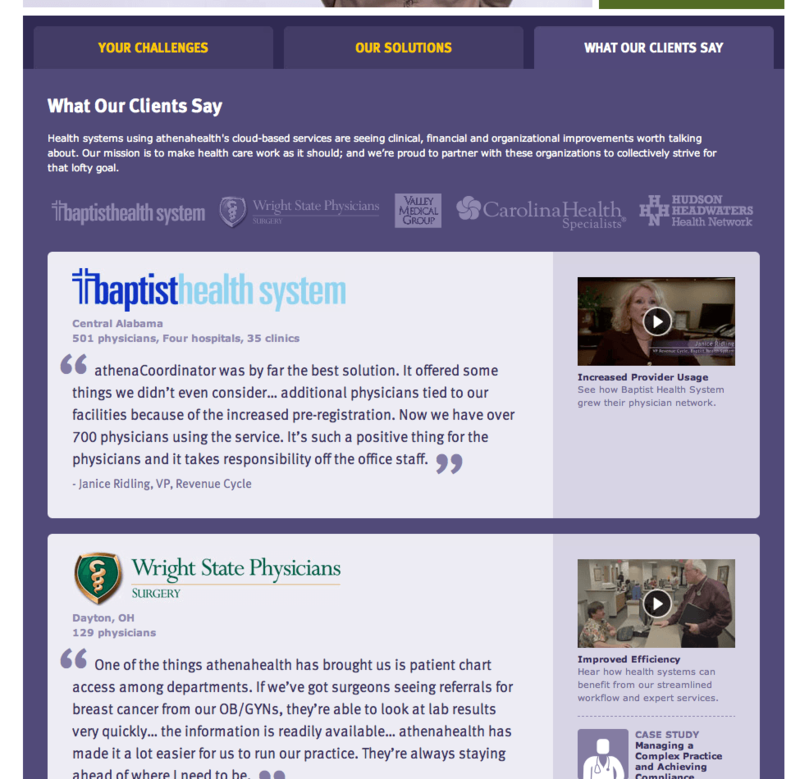 Examples of Customer Testimonials Being Used On Websites | Rewatchable, Inc. Anyone who spends 5 minutes on our website or talking with us knows Rewatchable produces customer testimonial videos. We love making customer testimonial videos because we think a customer testimonial video is the most effective way for any business to build trust and sell more. We have plenty of customer testimonial video examples throughout our website. Those testimonial examples were produced by Rewatchable and they are only a sampling of the testimonial videos we have actually produced. This blog post is not about customer testimonial videos we created. In this post, we wanted to share some customer testimonials we have seen in use on websites from businesses throughout Massachusetts and all across the world. We hope showing these customer testimonials in use on real websites will be helpful to businesses looking to create their own customer testimonial campaign. We hope the examples give you ideas about varying video production styles along with how to place the customer testimonial videos on your website. As we find new and interesting customer videos in use we will add to this page. In the meantime, if you would like to talk about producing a customer testimonial for your business give us a call at 978.666.4068. One look at marketing automation software company Marketo’s testimonial video page shows the viewer LOTS of people are willing to say nice things about their company. The page features more than 60 testimonial videos. 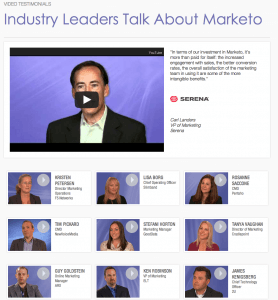 We’re guessing at some point Marketo decided client testimonial videos are a good investment! Marketo is based in San Mateo, CA. Link to Marketo Testimonial Video Page. 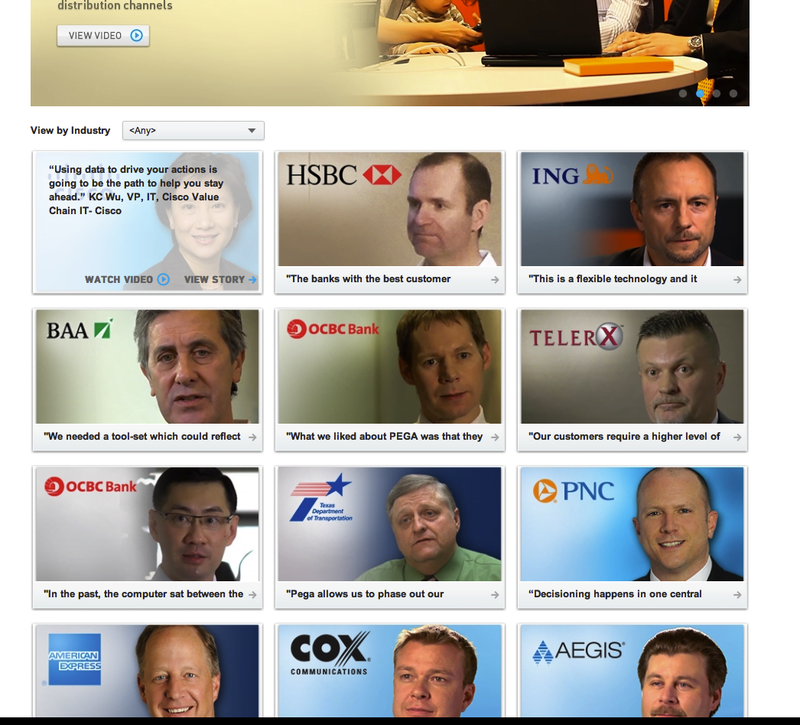 SAP has a number of customer testimonial videos featured throughout their website. One of the videos features a customer testimonial from a Saudi Arabian company called Tasnee. Link to Tasnee customer testimonial. The page is a link from SAPs Customer Testimonial Spotlight Page. SAP is based in Germany but has offices all over the world including Burlington, MA. Qualys is an on demand vulnerability management and policy compliance company. From their main page, Qualys has a menu item called “video testimonials”. When clicked, a customer testimonial video plays automatically and the viewer can see a number of testimonial videos in the background. Visually the page is powerful because the viewer not only sees a number of customers recommending Qualys but they also see many logo from major companies like Novartis, Dupont & Sun. Qualys is located in Redwood City, CA. Vertica is a Big Data company based out of Cambridge, MA. They have a page that features customer testimonial videos as long as 22 minutes and as short as 4 minutes. 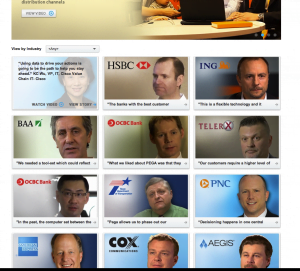 In addition to the video testimonials, the page also includes text-based client testimonials. Although many companies are moving away from text-based testimonials we think featuring them alongside the video testimonials is a great way to leverage the text testimonials while showing off some big name customers that might not ready to go on camera for a variety of reasons. Vertica is an HP company. Verttica customer testimonial page. Rewatchable will continue to add more customer testimonials to this page as we find video testimonial pages that might be helpful to our customers. Rewatchable is a video production company based near Boston, MA. We create video testimonials throughout the Boston, MA area and we are happy to travel throughout the United States. Learn more about our customer testimonial video services. Give us a call at 978.666.4068 to talk about ideas for your customer testimonial video campaign.